Laminated shims make life easier for designers and machine operators, as long as they're properly specified. It's often quicker and less expensive to use a shim, a thin piece of metal or composite, to level a machine tool or make components fit together than grinding and machining to make the same mechanical adjustments. Shims act like those folded pieces of paper people place under table legs to prevent the table from wobbling. They are also used to quell vibrations and silence noisy equipment. But laminated shims are more versatile and economical than silvers of paper or machined wedges. 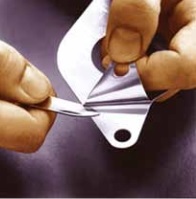 Laminated shims have peelable layers of metal or composite which are removed until the shim has the proper thickness Adjusting them is as easy as peeling off lamination with a knife, or in the case of some materials, using no tool at all. They are built up from layers of precision-gauge metal foil or composites. Layers are bonded into a rigid structure that appears and functions as a solid sheet or plate. The finished shims withstand reasonable handling, including shearing and machining. Laminated shims are produced by surface-bonding layers of precision-metal foils or composite films and resin adhesive into sheets. The foils can be aluminum, stainless steel, carbon steel , and brass, among others. Final shims range from 0.006" to 0.250" thick. The bond is made by heat and pressure, which hardens and reduces the resin to a point where it is almost undetectable. A temperatures above approximately 300°F (150°C), however, the bonding agent may deteriorate and there will be a negligible loss of total thickness. But even heating the resin to above 446°F does not influence the performance of the shim. Designers should know the forces that will be placed on the laminated shim before choosing a shim material. And shim faces should not be exposed to friction-causing motions unless the shim has a PTFE treatment. Otherwise, the shim could delaminate. However, if parts have location holes, the only forces will be those exerted by the tightening of screws. In this case there are no limitations on using laminated shims. Laminated shims should be machined rather than stamped. Machining leaves clean edges that make shims easier to peel. Machining also prevents burrs from forming when peeling layers away. The burrs are a by-product of die rolls and stamping. Laminated shims can be partially solid and partially laminated. This type of shim is either half-solid or three-quarter solid, depending on the ratio of solid section to total thickness. Standard thicknesses for the solid part are 0.062", 0.094", and 0.125". Semisolid shims are used to add rigidity to a design, accommodate a bearing surface on one side of the shim, meet requirements for a thick shim that will have minimal adjustments made to it, and to lower costs. There are some size restrictions on laminated shims. For example, brass laminated shims larger than 12" in diameter must be made in sections. As a general rule of thumb, all thicknesses should never be less than three times the total material thickness. Edges of laminated shims should not be rounded, and deburring laminated shims may make them difficult to peel. 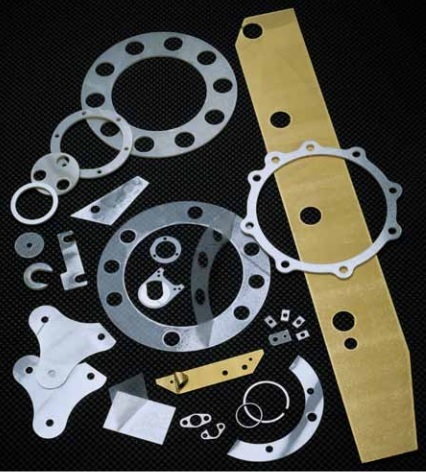 Shims eliminate the time and cost of putting precision tolerances on mating components. They also compensate for accumulated tolerances during assembly. It is better to design in a shim than to discover later you need one at the assembly stage.